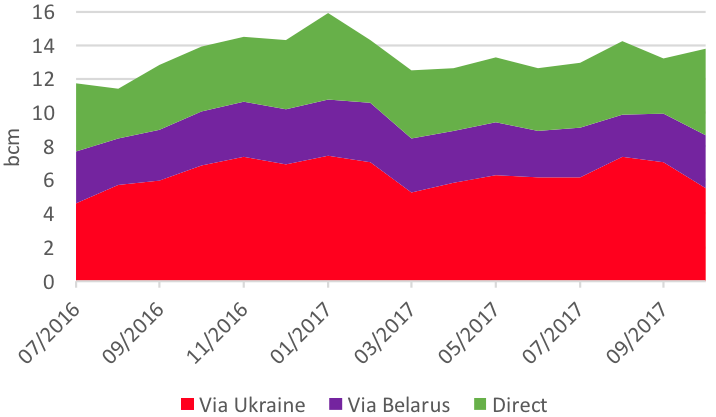 Gazprom is now able to use Nord Stream almost fully, the summer maintenance period being over, and so flows through Ukraine could taper off to compensate. Since the end of Nord Stream 1 maintenance September 22, direct flows from Russia to the EU have been above 180mn m³/d as disclosed by Gazprom, leading to higher overall exports to EU in October (+ 0.6bn m³ compared with September). Nord Stream's nameplate capacity is 55bn m³yr (151mn m³/d). 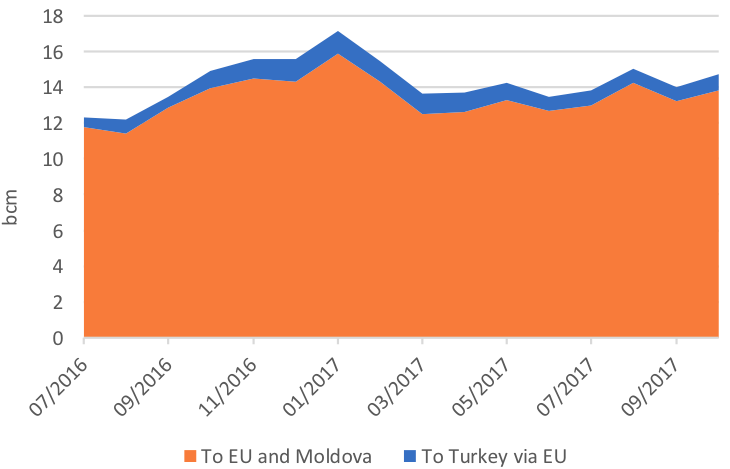 With 13.8bn m³ exported in October, direct flows were up as expected in our September update by a massive 56% vs September at the expense of the Ukrainian transit, which has gone down 22%. As discussed in the last monthly update, with direct flows at 5.1bn m³ in October, we are now at a record level, just slightly higher than the past record in January 2017, the first – and last – full month ever where the Opal capacity restrictions were lifted before descending once again till very late in July. And with the lifting of the ban on using that German onshore Nord Stream offshoot, Gazprom should continue to prefer to use Nord Stream 1. We therefore expect direct flows to remain above 5bn m³/month all year long when Nord Stream 1 is available. 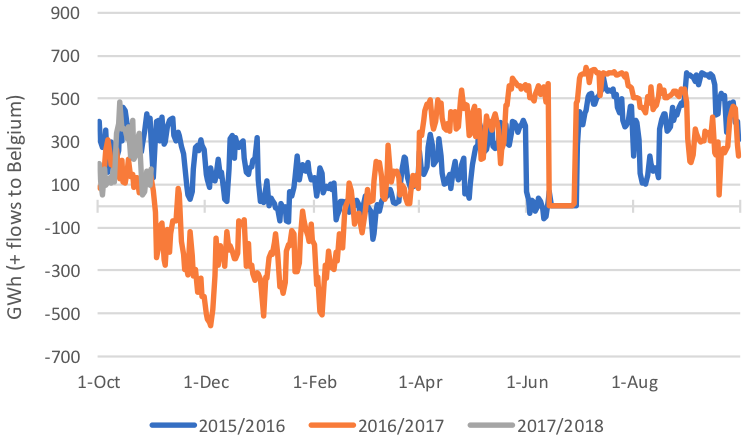 Interestingly, this month has been the first time since data became available (July 2016) that a year on year drop was recorded, showing that Gazprom strategy is not to flood the market but to adjust volumes to maximise revenues (a function of both volumes and prices). At a time IUK should soon move from exports to Belgium to imports from Belgium, and with the major UK storage facility Rough closed to new injections, we should need more imports on the Continent. Gazprom can increase exports to accommodate this or witness higher prices to attract LNG… Stay tuned!